Qualia's north-facing Windward Pavilions come with their own plunge pools overlooking the Coral Sea (photo: Elise Hassey). In 2012 an elegant simplicity and a fine attention to detail turned a corner of Hamilton Island into the best resort in the world. Is that still the case? We find out. The best resort in the world? Here in Australia? No, you must be joking. Bird’s eye view, qualia (photo: Elise Hassey). Such was the cry that went up in 2012, when the honour of all honours was bestowed on a humble island resort most commonly popularised as the 1980s home of the high-rise holiday, no less. But qualia’s secret ingredient is really not that mysterious but a fairly simple proposition: it’s lovely. Snorkelling is a must at Hamilton Island (photo: Elise Hassey). But such simplicity is complex, of course; and much goes on behind the scenes here in order to achieve it. Here are some of the most surprising details from behind the scenes. Arriving at qualia is a little like rolling the opening credits of a Spielberg production: large wooden gates loom below even larger stone walls, a silently grandiose imposition on the tangle of ferns and palms that streak the sky. A bespoke carved slab of wood – made from local Sugarloaf mountain timber – confirms the resort’s presence, though the Relais & Chateaux placard is a lone hint at the pleasures beyond. It is a dramatic entrance, but the opening doors reveal a place of surprisingly earthy, simple pleasures. Paths wind around tropical sculptured gardens filled with small surprises: fat, juicy cluster figs begging to be plucked off native trees, harmless green tree snakes curl up on warm rocks, fluttering dragonflies and butterflies zoom through whispering leaves. Refreshingly secluded: qualia, Hamilton Island. The pavilions themselves are set in a wild tangle of eucalypts and the fingers of wispy palms; that joyous Whitsundays water twinkling between fronds from nearly all angles. The overall impression is one without artifice, but careful landscaping is maintained at all times, and to a level of thoughtfulness that is quite extraordinary: the six or so kilometres of hedging lining the pathways, for example, are all hand-hedged, so that guests are never disturbed by garden machinery. Enjoy the Whitsunday vistas from your own plunge pool in a Windward pavilion. A similarly intricate drip system – relating back to the Oatleys’ wine production days, and said to be personally monitored by family patriarch Robert Oatley – crisscrosses its way over the island, feeding hundreds of thousands of litres of treated, effluent water into the soil, itself a considered product of composting (which takes place on the mainland, in qualia’s 10 enormous worm farms). Perhaps most illuminating, however, is the war being waged on weary grounds keepers by the island’s many wallabies. “We’ve tried everything to stop them from eating the spider lilies,” says garden supervisor Andrew Collett, referring to the pretty natives that line pathways. “Even garlic.” But this is their home, too, so grounds keepers do what they can to coexist in peace. When the marauding marsupials chewed away the grass beside the spa, it was simply replaced (for a cool $12,000). The garden must go on. The coolest place in the Whitsundays (both literally and figuratively)? The library at qualia. With conservative red and navy cushioning, high timber ceilings and doors that whoosh when you open them – as if vacuum-sealed from reality – the library is, by all appearances, a space dedicated to serious readers. Interior designers Freedman furnished qualia with fabrics and patterns inspired by nature (photo: Elise Hassey). Until you begin perusing the books, that is. Beautifully presented and thoughtfully curated, with a selection that ranges from the esoteric and artful to a glossy tome on Valentino so enormous it requires its own table, there is nonetheless a relaxed quirk of Australian humour that streaks the shelves, something that perhaps best summarises the atmosphere at qualia. Keep an eye out for the amusingly solid hardcover titled Luxury For Dogs. It’s the most well-thumbed book at the resort, which we’d suggest makes for a high endorsement of the guests who patronise the resort. People often burst into tears upon arriving at the main gates, says resort general manager Matthew Taverner, and you can understand why if only for the initial views, which are quite superb. But tears are more often engineered by staff, he says, who are well-trained in putting together special moments, discreet entrances and exits for guests of particular fame, and “outrageous proposals”. He shares a personal favourite from the latter category: “The gentleman of the couple had organised a mock check-in down the road at the Reef View Hotel, and after they arrived, put their bags down in the room and so on, he suggested that they go for a little drive around the island. 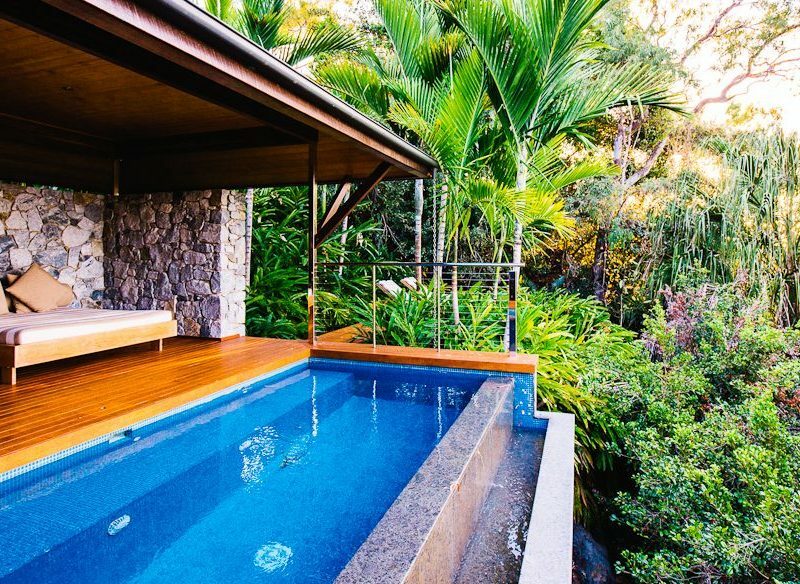 Languid pool time at qualia (photo: Elise Hassey). Indeed the staff are an exceptional part of the qualia experience, even if you’re not planning a proposal of marriage. Our suggestion: take a sailing lesson with Jessica Hansen, a sweet-natured young woman who happens to not only be rather good at encouraging first-timers to aptly sail the resort’s small yachts, but is also a world-champion in 18-foot and 29-foot skiff racing. Or take a garden tour with one of the garden supervisors such as the aforementioned Andrew Collett, who’ll not only point out and pick edible fruits, and share the indigenous history and uses of certain plants, but will let you in on his favourite secret lookout spots. Or – perhaps our favourite – ask the staff to organise a seaplane experience for you. You really won’t appreciate the context of your World Heritage-listed environment until you’ve seen it from above, as these pictures attest. What does it take to be the best spa in Australia? “More than massages,” says spa manager Leah Hesse with a laugh. Of the 30 to 40 treatments performed here each day, most are package experiences lasting two to three hours, she says. There are a staggering range of complex- and exquisite-sounding treatments, including the particularly unique hot stone massage. This is carried out with warm stones called Bularri Yarrul, explains Hesse, which are taken from a riverbed in central Australia “by an indigenous man who picks them up and determines whether they’re ‘working stones’ or not by their feel”. It’s completed with the gift of a hand-painted stone, the proceeds of which return to the Aboriginal art community from whence it came. For all the natural wonders and simple pleasures on offer here, there is one aspect of the resort most often lauded: the Windward Pavilions. 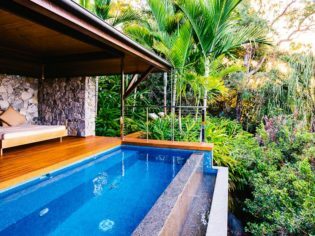 With their magnificently pretty plunge pools and that joyous Whitsundays water as a backdrop, twinkling between fronds from nearly all angles, some might anticipate gold-plated taps and intricately folded towels, but they are quite the opposite: the details here are altogether more intuitive. Stone, wood and an enormous wall of glass allow for nature’s masterpiece to take pride of place, with retractable glass ‘windows’ in some pavilions that slide down entirely under floor, allowing entrance on to a balcony overlooking the water. The deck chair with a view at a Windward pavilion, Hamilton Island. The contents of the mini bar – organic, artisan, local, Australian – were finalised over a roundtable of 10 people, and involved consideration of 70 products. Meanwhile, pools are permanently heated to 28°C – approximately 2.5 degrees warmer than Olympic swimming pools are during competitions, explains Taverner, “and a pleasant temperature yearround”. And, quite amazingly, every visitor is guaranteed that new feeling, every time they visit. Because each and every week, one pavilion is taken out of action for maintenance and completely stripped. The sumptuous free standiung bathtubs with a view of a Windward pavilion, qualia. Floorboards are refinished, reprinted and revarnished, walls are repainted, air conditioners are retuned; and by the time every pavilion in the property has been properly finished, approximately five months later, it’s time to commence the renewal process all over again. If luxury is the absence of problems, perhaps qualia is the epitome of luxury. Qantas, Jetstar and Virgin Australia all fly direct to Hamilton Island’s Great Barrier Reef Airport. Accommodation includes transfers to and from the airport. If you’re coming from the Whitsunday Coast Airport in Proserpine, book a transfer to Abel Point Marina in Airlie Beach where it’s a 30-minute boat ride to the island. A Leeward Pavilion suite at qualia is from $1350 a night with breakfast. The Windward Pavilion suites start at $2000 including breakfast. The Beach House is from $4800 a night with breakfast. So serene, peaceful, well equipped, great rooms, this is a total experience not just a getaway. So, we’re guessing you enjoyed your stay? Sounds very much like the stuff dreams are made from. I’ll look forward to the day when I can visit.